Harry Winston Diamond Corporation (TSX: HW, NYSE:HWD) (the "Company") today announced its third quarter Fiscal 2012 results for the period ending October 31, 2011. Robert Gannicott, Chairman and Chief Executive Officer said, "Challenging trading conditions returned to the diamond business internationally in the third quarter. However, this was not the sudden, hard shock of 2008/2009 and, being better equipped to weather a downturn than in 2008/9, we elected not to sell the full rough diamond production into a weak market during the quarter but continued to supply the segments where demand remained resilient. We have now resumed a wider range of rough diamond sales as the market has recovered some poise in the light of continuing good consumer demand. Our luxury brand segment has seen increased unit sales as we continue to broaden the focus of our jewelry and timepieces." increase of 4% or a decrease of 4% at constant exchange rates. to $24.9 million in the comparable quarter of the prior year. this segment recorded an operating loss of $3.3 million. compared to $9.4 million in the same quarter of the prior year. in China during early 2012. $106.2 million availability in its credit facilities. Complete financial statements, MD&A and a discussion of risk factors are included in the accompanying release. Outlook Diavik's full-year 2011 target production remains at 6.9 million carats. The Company expects that the retention of some stockpiled goods will result in carats sold being lower than carats produced for fiscal 2012. Having made very limited sales to specialized clients in October and November, the Company has resumed broader sales in December. The lack of credit available to diamond processors continues to constrain the industry. A new life-of-mine plan is under final review by Rio Tinto plc and the Company, and is expected to be released prior to the 2012 fiscal year-end. Production for calendar 2012 is currently forecasted at approximately 8.3 million carats. For the luxury brand segment, the Company continues to focus on strategies that will drive long-term growth. These strategies include initiatives to grow the core bridal and watch businesses, and new jewelry collections. In addition to the recently opened licensed Harry Winston salon in the Dubai Emirate Towers, a second licensed salon is expected to open in Dubai this fiscal year. The Company plans to add 10 wholesale watch doors through the remainder of the current fiscal year for a total door count of 200 wholesale timepiece doors. The Company expects to open two directly operated salons in Shanghai at the beginning of the next fiscal year, and also expects to open a second directly operated salon in London next fiscal year. The Company reaffirms the luxury brand's five year vision presented last year, with goals through fiscal 2016 of growing sales at a cumulative annual growth rate in the mid-teens, generating gross margins in the low 50% range, and operating profit margins in the low to mid-teen range. Conference Call and Webcast Beginning at 8:30AM (ET) on Friday, December 9, the Company will host a conference call for analysts, investors and other interested parties. Listeners may access a live broadcast of the conference call on the Company's investor relations web site at http://investor.harrywinston.com or by dialing 866-713-8563 within North America or 617-597-5311 from international locations and entering passcode 89392901. An online archive of the broadcast will be available by accessing the Company's investor relations web site at http://investor.harrywinston.com. A telephone replay of the call will be available one hour after the call through 11:00PM (ET), Friday, December 23, 2011 by dialing 888-286-8010 within North America or 617-801-6888 from international locations and entering passcode 66511433. About Harry Winston Diamond Corporation Harry Winston Diamond Corporation is a diamond enterprise with premium assets in the mining and retail segments of the diamond industry. Harry Winston supplies rough diamonds to the global market from its 40 percent ownership interest in the Diavik Diamond Mine. The Company's luxury brand segment is a premier diamond jeweler and luxury timepiece retailer with salons in key locations, including New York, Paris, London, Beijing, Tokyo, Hong Kong and Beverly Hills. The Company focuses on the two most profitable segments of the diamond industry, mining and retail, in which its expertise creates shareholder value. This unique business model provides key competitive advantages; rough diamond sales and polished diamond purchases provide market intelligence that enhances the Company's overall performance. For more information, please visit www.harrywinston.com or for investor information, visit http://investor.harrywinston.com. Consolidated sales were $119.7 million for the third quarter compared to $140.9 million for the comparable quarter of the prior year, resulting in a 21% decrease in gross margin to $44.2 million and an operating loss of $2.0 million, compared to an operating profit of $14.8 million in the comparable quarter of the prior year. Consolidated EBITDA was $21.2 million compared to $33.5 million in the comparable quarter of the prior year. The mining segment recorded sales of $36.2 million, a 40% decrease from $60.7 million in the comparable quarter of the prior year. The decrease in sales resulted from a 64% decrease in volume of carats sold, as the Company has chosen to hold inventory due to market conditions, which was partially offset by a 68% increase in achieved rough diamond prices. The mining segment recorded an operating loss of $3.3 million compared to an operating profit of $9.4 million in the comparable quarter of the prior year. Included in the operating loss was an $13.0 million ($8.4 million after tax) non-cash charge related to the de-recognition of certain assets associated with paste production at the Diavik Diamond Mine, which are no longer expected to be required for underground mining. EBITDA for the mining segment was $16.7 million compared to $24.9 million in the comparable quarter of the prior year. The luxury brand segment recorded sales of $83.5 million, an increase of 4% from sales of $80.2 million in the comparable quarter of the prior year (a decrease of 4% at constant exchange rates). Operating profit was $1.3 million for the quarter compared to $5.4 million in the comparable quarter of the prior year. EBITDA for the luxury brand segment was $4.5 million compared to $8.6 million in the comparable quarter of the prior year. The Company recorded a consolidated net loss attributable to shareholders of $4.7 million or $0.06 per share for the quarter, compared to a net profit attributable to shareholders of $12.7 million or $0.15 per share in the third quarter of the prior year. Excluding the $8.4 million after-tax de-recognition of paste production assets, the Company would have recorded a net profit attributable to shareholders of $3.7 million or $0.04 per share for the quarter. The following is management's discussion and analysis ("MD&A") of the results of operations for HarryWinston Diamond Corporation ("HarryWinston Diamond Corporation", or the "Company") for the three and nine months ended October 31, 2011, andits financial position as at October 31, 2011. This MD&A is based on the Company's unaudited interim condensed consolidated financial statements prepared in accordance with International Financial Reporting Standards ("IFRS") and should be read in conjunction with the unaudited interim condensed consolidated financial statements and notes thereto for the three and nine months ended October 31, 2011, and for the three months ended April 30, 2011, and the audited consolidated financial statements of the Company and notes thereto for the year ended January 31, 2011 (prepared in accordance with generally accepted accounting principles in Canada ("Canadian GAAP" or "CDN GAAP")). Unless otherwise specified, all financial information is presented in United States dollars. Unless otherwise indicated, all references to "third quarter" refer to the three months ended October 31. Unless otherwise indicated, references to "international" for the luxury brand segment refer to Europe and Asia. Certain information included in this MD&A may constitute forward-looking information within the meaning of Canadian and United States securities laws. In some cases, forward-looking information can be identified by the use of terms such as "may", "will", "should", "expect", "plan", "anticipate", "foresee", "appears", "believe", "intend", "estimate", "predict", "potential", "continue", "objective", "modeled" or other similar expressions concerning matters that are not historical facts. Forward-looking information may relate to management's future outlook and anticipated events or results, and may include statements or information regarding plans, timelines and targets for construction, mining, development, production and exploration activities at the Diavik Diamond Mine, future mining and processing at the Diavik Diamond Mine, projected capital expenditure requirements and the funding thereof, liquidity and working capital requirements and sources, estimated reserves and resources at, and production from, the Diavik Diamond Mine, the number and timing of expected rough diamond sales, the demand for rough diamonds, expected diamond prices and expectations concerning the diamond industry and the demand for luxury goods, expected cost of sales and gross margin trends in the mining segment, targets for compound annual growth rates of sales and operating income in the luxury brand segment, plans for expansion of the retail salon network, and expected sales trends and market conditions in the luxury brand segment. Actual results may vary from the forward-looking information. See "Risks and Uncertainties" on page 18 for material risk factors that could cause actual results to differ materially from the forward-looking information. Forward-looking information is based on certain factors and assumptions regarding, among other things, mining, production, construction and exploration activities at the Diavik Diamond Mine, world and US economic conditions and the worldwide demand for luxury goods. Specifically, in making statements regarding expected diamond prices and expectations concerning the diamond industry and expected sales trends and market conditions in the luxury brand segment, the Company has made assumptions regarding, among other things, the state of world and US economic conditions, worldwide diamond production levels, and demand for luxury goods. While the Company considers these assumptions to be reasonable based on the information currently available to it, they may prove to be incorrect. See "Risks and Uncertainties" on page 18. Forward-looking information is subject to certain factors, including risks and uncertainties, which could cause actual results to differ materially from what we currently expect. These factors include, among other things, the uncertain nature of mining activities, including risks associated with underground construction and mining operations, risks associated with joint venture operations, including risks associated with the inability to control the timing and scope of future capital expenditures, risks associated with the remote location of and harsh climate at the Diavik Diamond Mine site, risks resulting from the Eurozone financial crisis, risks associated with regulatory requirements, fluctuations in diamond prices and changes in US and world economic conditions, the risk of fluctuations in the Canadian/US dollar exchange rate, cash flow and liquidity risks, the risks relating to the Company's expansion strategy and of competition in the luxury jewelry business as well as changes in demand for high-end luxury goods. Please see page 18 of this Interim Report, as well as the Company's current Annual Information Form, available at www.sedar.com, for a discussion of these and other risks and uncertainties involved in the Company's operations. Readers are cautioned not to place undue importance on forward-looking information, which speaks only as of the date of this MD&A, and should not rely upon this information as of any other date. Due to assumptions, risks and uncertainties, including the assumptions, risks and uncertainties identified above and elsewhere in this MD&A, actual events may differ materially from current expectations. The Company uses forward-looking statements because it believes such statements provide useful information with respect to the expected future operations and financial performance of the Company, and cautions readers that the information may not be appropriate for other purposes. While the Company may elect to, it is under no obligation and does not undertake to update or revise any forward-looking information, whether as a result of new information, future events or otherwise at any particular time, except as required by law. Additional information concerning factors that may cause actual results to materially differ from those in such forward-looking statements is contained in the Company's filings with Canadian and United States securities regulatory authorities and can be found at www.sedar.com and www.sec.gov, respectively. Harry Winston Diamond Corporation is a diamond enterprise with premium assets in the mining and retailing segments of the diamond industry. The Company supplies rough diamonds to the global market from its 40% ownership interest in the Diavik Diamond Mine, located in Canada's Northwest Territories. The Company's luxury brand segment is a premier diamond jeweler and luxury timepiece retailer with salons in key locations including New York, Paris, London, Beijing, Tokyo, Hong Kong and Beverly Hills. The Company's mining asset is an ownership interest in the Diavik group of mineral claims. The Diavik Joint Venture (the "Joint Venture") is an unincorporated joint arrangement between Diavik Diamond Mines Inc. ("DDMI") (60%) and HarryWinston Diamond Limited Partnership ("HWDLP") (40%) where HWDLP holds an undivided 40% ownership interest in the assets, liabilities and expenses of the Diavik Diamond Mine. DDMI is the operator of the Diavik Diamond Mine. DDMI and HWDLP are headquartered in Yellowknife, Canada. DDMI is a wholly owned subsidiary of Rio Tinto plc of London, England. The Diamond Market During the third quarter, rough diamond prices dropped from the highs achieved in the second quarter, primarily due to the ongoing European sovereign debt crisis. In addition, a build-up of rough diamond inventories prior to the traditionally quiet religious holiday period in India and Israel enabled buyers to exert downward pressure on polished diamond prices. However, the retail diamond market continued to be resilient, leading to an improvement in both the rough and polished diamond markets at the beginning of the fourth quarter. The Luxury Jewelry & Timepiece Market The luxury jewelry and timepiece market experienced moderate growth during the third quarter as demand from emerging markets remained strong, offsetting the effects of economic uncertainty in Europe and the US. With the trend of rapidly rising wealth and increased mobility of Asian clients, these customers represent a growing share of clientele in all sales regions. New wealthy Chinese consumers continue to be attracted to established luxury brands that have a reputation for providing the highest levels of quality and service. millions of United States dollars. ("EBITDA"). See "Non-GAAP Measure" on page 17. Analysis" on page 9 for additional information. The Company recorded a third quarter consolidated net loss attributable to shareholders of $4.7 million or $0.06 per share compared to a net profit attributable to shareholders of $12.7million or $0.15 per share in the third quarter of the prior year. Excluding the $8.4 million after-tax de-recognition of certain paste production assets in the mining segment, the Company would have recorded a net profit attributable to shareholders of $3.7 million or $0.04 per share for the quarter. Sales for the third quarter totalled $119.7 million, consisting of rough diamond sales of $36.2 million and luxury brand segmentsales of $83.5 million. This compares to sales of $140.9 million in the comparable quarter of theprior year (rough diamond sales of $60.7million and luxury brand segment sales of $80.2 million). See"Segmented Analysis" on page 9 for additional information. The Company's third quarter cost of sales was $75.5 million, for a gross margin of 36.9% compared toa cost of sales of $84.8 million and a gross margin of 39.8% for the comparable quarter of the prior year. The Company's cost of sales includes costs associated with mining, rough diamond sorting and luxury brand sales activities. See "Segmented Analysis" on page9 for additional information. The principal components of selling, general and administrative ("SG&A") expenses include expenses for salaries and benefits, advertising and marketing, rent and building related costs. The Company incurred SG&A expenses of $46.2 million for the third quarter compared to $41.3million in the comparable quarter of the prior year. Included in SG&A expenses for the third quarter was $5.4 million for the mining segment compared to $6.2 million for the comparable quarter of the prior year and $40.8 million for the luxury brand segment compared to $35.1 million for the comparable quarter of the prior year. See"Segmented Analysis" on page 9 for additional information. The Company recorded a net income tax recovery of $1.3 million during the third quarter, compared to a net income tax recovery of $2.4 million in the comparable quarter of the prior year. The Company's combined Canadian federal and provincial statutory tax rate for the quarter is 27.9%. There are a number of items that can significantly impact the Company's effective tax rate, including foreign currency exchange rate fluctuations, the Northwest Territories mining royalty, earnings subject to tax different than the statutory rate such as earnings in foreign jurisdictions, and changes in valuation allowances. As a result, the Company's recorded tax provision can be significantly different than the expected tax provision calculated based on the statutory tax rate. The recorded tax provision is particularly impacted by foreign currency exchange rate fluctuations. The Company's functional and reporting currency is US dollars; however, the calculation of income tax expense is based on income in the currency of the country of origin. As such, the Company is continually subject to foreign exchange fluctuations, particularly as the Canadian dollar moves against the US dollar. During the third quarter, the Canadian dollar weakened against the US dollar. As a result, the Company recorded an unrealized foreign exchange gain of $8.1 million on the revaluation of the Company's Canadian dollar denominated deferred income tax liability. This compares to an unrealized foreign exchange loss of $2.8 million in the comparable quarter of the prior year. The unrealized foreign exchange gain is recorded as part of the Company's deferred income tax recovery, and is not taxable for Canadian income tax purposes. During the third quarter, the Company also recognized a deferred income tax expense of $11.4 million for temporary differences arising from the difference between the historical exchange rate and the current exchange rate on translation of foreign currency non-monetary items. This compares to a deferred income tax recovery of $8.1 million recognized in the comparable quarter of the prior year. The recorded tax provision during the third quarter also included a net income tax recovery of $0.7 million relating to foreign exchange differences between income in the currency of the country of origin and the US dollar. This compares to a net income tax recovery of $1.3 million recognized in the comparable period of the prior year. The Company recorded a net income tax recovery of $2.9 million during the third quarter resulting from adjustments and reassessments to prior year tax returns. This compares to a net income tax recovery of nil recorded in the comparable period of the prior year. A deferred income tax recovery of $4.6 million was also recorded during the third quarter as a result of the de-recognition of certain paste production assets associated with the Diavik Diamond Mine. The rate of income tax payable by Harry Winston Inc. varies by jurisdiction. Net operating losses are available in certain jurisdictions to offset future income taxes payable in such jurisdictions. The net operating losses are scheduled to expire through 2031. Due to the number of factors that can potentially impact the effective tax rate and the sensitivity of the tax provision to these factors, as discussed above, it is expected that the Company's effective tax rate will fluctuate in future periods. Finance expenses of $4.2 million were incurred during the third quarter compared to $3.8 million during the comparable quarter of the prior year. Exploration costs of $0.6 million were incurred during the third quarter compared to $0.2 million in the comparable quarter of the prior year. Finance and other income of $0.3 million was recorded during the quarter compared to $0.1 million in the comparable quarter of the prior year. A net foreign exchange gain of $0.4 million was recognized during the quarter compared to a net foreign exchange gain of $0.1 million in the comparable quarter of the prior year. TheCompany does not currently have any significant foreign exchange derivative instruments outstanding. The Company recorded consolidated net profit attributable to shareholders of $8.9 million or $0.10 per share for the nine months ended October 31, 2011, compared to a net profit attributable to shareholders of $27.8million or $0.35 per share in the comparable period of the prior year. Excluding the $8.4 million after-tax de-recognition of certain paste production assets in the mining segment, the Company would have recorded a net profit attributable to shareholders of $17.3 million or $0.20 per share for the period. Sales for the nine months ended October 31, 2011, totalled $486.0 million, consisting of rough diamond sales of $187.9 million and luxury brand segmentsales of $298.1 million. This compares to sales of $408.6 million in the comparable period of theprior year (rough diamond sales of $196.5million and luxury brand segment sales of $212.1million). See"Segmented Analysis" on page 9 for additional information. The Company's cost of sales for the nine months ended October 31, 2011, was $322.2 million, for a gross margin of 33.7% compared toa cost of sales of $246.3 million and a gross margin of 39.7% in the comparable period of the prior year. The Company's cost of sales includes costs associated with mining, rough diamond sorting and luxury brand sales activities. See "Segmented Analysis" on page9 for additional information. The principal components of SG&A expenses include expenses for salaries and benefits, advertising and marketing, rent and building related costs. The Company incurred SG&A expenses of $138.1 million for the nine months ended October 31, 2011, compared to $115.2million in the comparable period of the prior year. Included in SG&A expenses for the nine months ended October 31, 2011, was $19.1 million for the mining segment compared to $14.9 million for the comparable period of the prior year and $119.0 million for the luxury brand segment compared to $100.3 million for the comparable period of the prior year. See"Segmented Analysis" on page 9 for additional information. The Company recorded a net income tax expense of $3.2 million during the nine months ended October 31, 2011, compared to a net income tax expense of $2.9 million in the comparable period of the prior year. The Company's combined Canadian federal and provincial statutory tax rate for the quarter is 27.9%. There are a number of items that can significantly impact the Company's effective tax rate, including foreign currency exchange rate fluctuations, the Northwest Territories mining royalty, earnings subject to tax different than the statutory rate, such as earnings in foreign jurisdictions, and changes in valuation allowances. As a result, the Company's recorded tax provision can be significantly different than the expected tax provision calculated based on the statutory tax rate. The recorded tax provision is particularly impacted by foreign currency exchange rate fluctuations. The Company's functional and reporting currency is US dollars; however, the calculation of income tax expense is based on income in the currency of the country of origin. As such, the Company is continually subject to foreign exchange fluctuations, particularly as the Canadian dollar moves against the US dollar. During the nine months ended October 31, 2011, the Canadian dollar strengthened against the US dollar. As a result, the Company recorded an unrealized foreign exchange loss of $1.7 million on the revaluation of the Company's Canadian dollar denominated deferred income tax liability. This compares to an unrealized foreign exchange loss of $9.0 million in the comparable period of the prior year. The unrealized foreign exchange loss is recorded as part of the Company's deferred income tax recovery, and is not deductible for Canadian income tax purposes. During the nine months ended October 31, 2011, the Company also recognized a deferred income tax expense of $2.8 million for temporary differences arising from the difference between the historical exchange rate and the current exchange rate on translation of foreign currency non-monetary items. This compares to a deferred income tax recovery of $14.7 million recognized in the comparable period of the prior year. The recorded tax provision during the nine months ended October 31, 2011 also included a net income tax recovery of $3.8 million relating to foreign exchange differences between income in the currency of the country of origin and the US dollar. This compares to a net income tax recovery of $3.1 million recognized in the comparable period of the prior year. The Company recorded a net income tax recovery of $2.6 million during the third quarter resulting from adjustments and reassessments to prior year tax returns. This compares to a net income tax recovery of 1.7 million recorded in the comparable period of the prior year. Finance expenses of $13.3 million were incurred during the nine months ended October 31, 2011, compared to $9.7 million during the comparable period of the prior year. Finance expenses were impacted by increased debt levels in the mining segment related to the drawdown of $60.0 million on the Standard Chartered Bank credit facility and the $70.0 million promissory note payable to Kinross Gold Corporation ("Kinross") issued on August 25, 2010, which was repaid on August 25, 2011. Exploration costs of $1.6 million were incurred during the nine months ended October 31, 2011, compared to $0.3 million in the comparable period of the prior year. Finance and other income of $0.6 million was recorded during the nine months ended October 31, 2011, compared to $0.4 million in the comparable period of the prior year. A net foreign exchange gain of $0.5 million was recognized during the nine months ended October 31, 2011, compared to a net foreign exchange loss of $1.0 million in the comparable period of the prior year. TheCompany does not currently have any significant foreign exchange derivative instruments outstanding. The operating segments of the Company include mining and luxury brand segments. Mining The mining segment includes the production, sorting and sale of rough diamonds. amortization ("EBITDA"). See "Non-GAAP Measure" on page 17. During the quarter, the Company sold 0.23 million carats for a total of $36.2 million for an average price per carat of $159 compared to 0.64million carats for a total of $60.7 million for an average price per carat of $95 in the comparable quarter of the prior year. The decrease in sales resulted primarily from a 64% decrease in volume of carats sold as the Company chose to hold inventory due to market conditions. The 68% increase in the Company's achieved rough diamond price per carat was primarily the result of the Company's decision to hold back some lower priced goods due to a current oversupply in the market. On a quarterly basis, the Company expects that results for its mining segment will continue to fluctuate depending on the seasonality of production at the Diavik Diamond Mine, the number of sales events conducted during the quarter, rough diamond prices and the volume, size and quality distribution of rough diamonds delivered from the Diavik Diamond Mine in eachquarter. The Company's third quarter cost of sales was $34.1 million, resulting in a gross margin of 5.9% compared to a cost of sales of $45.0million and a gross margin of 25.8% in the comparable quarter of the prior year. Cost of sales included $19.3 million of depreciation and amortization compared to $14.8 million in the comparable quarter of the prior year. Included in the cost of sales for the third quarter was a non-cash $13.0 million charge related to the de-recognition of certain components of the backfill plant (the "Paste Plant") associated with paste production at the Diavik Diamond Mine. The original mine plan envisioned the use of blasthole stoping and underhand cut and fill underground mining methods for the Diavik ore bodies using paste to preserve underground stability. It is now expected that the higher velocity and lower cost sub-level retreat mining method, which does not require paste, will be used for both the A-154 South and A-418 underground ore bodies. As a result, certain components of the Paste Plant necessary for the production of paste will no longer be required and accordingly have been de-recognized during the third quarter. Excluding this charge, cost of sales would have been $21.1 million (gross margin of 41.8%), a 53% decrease from the comparable quarter of the prior year. The mining gross margin is anticipated to fluctuate between quarters, resulting from variations in the specific mix of product sold during each quarter and rough diamond prices. A substantial portion of cost of sales is mining operating costs, which are incurred at the Diavik Diamond Mine. Cost of sales also includes sorting costs, which consist of the Company's cost of handling and sorting product in preparation for sales to third parties, and amortization and depreciation, the majority of which is recorded using the unit-of-production method over estimated proven and probable reserves. SG&A expenses for the mining segment decreased by $0.8 million from the comparable quarter of the prior year primarily due to the incurrence of executive severance charges of $1.0 million in the comparable quarter of the prior year. During the nine months ended October 31, 2011, the Company sold 1.3 million carats for a total of $187.9 million for an average price per carat of $148 compared to 1.9million carats for a total of $196.5 million for an average price per carat of $104 in the comparable period of the prior year. The decrease in sales resulted from a 33% decrease in volume of carats sold as the Company chose to hold inventory in the third quarter due to market conditions. This was partially offset by a 42% increase in the Company's achieved rough diamond price per carat, which was the result of the Company's decision to hold back some lower priced goods in the third quarter due to a current oversupply in the market combined with an overall increase in the market price of rough diamonds during the nine months ended October 31, 2011 versus the comparable period of the prior year. The Company expects that results for its mining segment will continue to fluctuate depending on the seasonality of production at the Diavik Diamond Mine, the number of sales events conducted during the quarter, rough diamond prices and the volume, size and quality distribution of rough diamonds delivered from the Diavik Diamond Mine and sold by the Company in eachquarter. The Company's cost of sales for the nine months ended October 31, 2011, was $155.2 million, resulting in a gross margin of 17.4% compared to a cost of sales of $143.6million and a gross margin of 26.9% in the comparable period of the prior year. Cost of sales included $52.6 million of depreciation and amortization compared to $40.9 million in the comparable period of the prior year. The increase in cost of sales was due primarily to a non-cash $13.0 million charge related to the de-recognition of certain components of the Paste Plant. Excluding this charge, cost of sales would have been $142.1 million (gross margin of 24.3%), a 1% decrease from the comparable period of the prior year. This decrease was the result of a 33% decrease in volume of carats sold during the period offset by a higher volume of production during the period from the higher cost underground mine. The mining gross margin is anticipated to fluctuate between quarters, resulting from variations in the specific mix of product sold during each quarter and rough diamond prices. SG&A expenses for the mining segment increased by $4.2 million from the comparable period of the prior year due to a mark-to-market on stock-based compensation and the strengthening of the Canadian dollar during the period. Ore production for the third calendar quarter consisted of 1.62million carats produced from 0.55 million tonnes of ore from the A-418 kimberlite pipe, 0.16million carats produced from 0.07 million tonnes of ore from the A-154 North kimberlite pipe, and 0.08million carats produced from 0.02million tonnes of ore from the A-154 South kimberlite pipe. Also included in production for the calendar quarter was an estimated 0.08 million carats from reprocessed plant rejects ("RPR"). These RPR are not included in the Company's reserves and resource statement and are therefore incremental to production. Rough diamond production was 8% higher than the comparable calendar quarter of the prior year due primarily to an increase in ore processed. The Company continues to expect Diavik Diamond Mine production in calendar 2011 of approximately 6.9 million carats from the mining of 2.4 million tonnes of ore and processing of 2.3 million tonnes of ore, with the increment stockpiled. It is expected that with the accelerated production towards the end of the year, carats shipped will be lower than carats produced in calendar 2011. This difference is expected to reverse in calendar 2012. Production for the year is expected to comprise approximately 1.8 million tonnes from the A-418 open pit, and 0.6 million tonnes from the underground portions of A-154 South and A-154 North. Beginning in July 2011, the higher grade A-154 South has been mined using sub-level retreat, a higher velocity and lower cost underground mining method. A new mine plan and budget for calendar 2012 is under final review by Rio Tinto plc and the Company. The plan for calendar 2012 foresees Diavik Diamond Mine production of approximately 8.3 million carats from the mining of 2.0 million tonnes of ore and processing of 2.2 million tonnes of ore. Open pit mining of approximately 1.0 million tonnes is expected to be exclusively from A-418. Underground mining of approximately 1.0 million tonnes is expected to be primarily sourced equally from the A-154 South and A-154 North kimberlite pipes. Included in the estimated production for calendar 2012 is approximately 1.0 million carats from RPR and 0.1 million carats from the implementation of an improved recovery process for small diamonds. These RPR and small diamond recoveries are not included in the Company's reserves and resource statement and are therefore incremental to production. Looking beyond calendar 2012, the objective is to fully utilize processing capacity with a combination of production from the underground and the A-21 open pit. Multiple mining techniques are under consideration for the A-21 resource with the intention to finalize the investment decision in late calendar 2012. In addition, exploratory drilling has improved the understanding of the ore at depth in the A-418 and A-154 North kimberlite pipes. This work is under technical review and should result in some ore resource being promoted to reserves and the addition of the extensions at depth into ore reserves. The rough diamond market experienced a decline in prices during the third quarter of fiscal 2012 from the highs achieved in the second quarter, which may persist until confidence returns to the global market. Based on prices from the Company's last complete rough diamond sale in July 2011 and the current diamond recovery profile of the Diavik processing plant, the Company has modeled the approximate rough diamond price per carat for each of the Diavik ore types in the table that follows. The Company estimates that with the softening rough diamond market, the current market prices have declined by approximately 25% from the July peak. The Company had projected cost of sales in fiscal 2012 of approximately $265 million (including depreciation and amortization of approximately $80 million) at an assumed average Canadian/US dollar exchange rate of $1.00. Due to lower-than-expected mining costs combined with a weaker Canadian/US dollar exchange rate, the Company would expect cost of sales of approximately $260 million (including depreciation and amortization of approximately $85 million) based on normal rough diamond sales. In light of current market conditions, the Company anticipates holding more rough diamond inventory than normal at January 31, 2012. Depending on the amount of rough diamond inventory carried over into fiscal 2013, a portion of the $260 million cost of sales forecasted for fiscal 2012 would be recognized in fiscal 2013. The Company expects cost of sales in fiscal 2013 to be approximately $275 million (including depreciation and amortization of approximately $90 million) due to an expected increase in the proportion of underground ore mined, which is more costly to produce. During fiscal 2012, HWDLP's 40% share of the planned capital expenditures at the Diavik Diamond Mine is expected to be approximately $58 million at an assumed average Canadian/US dollar exchange rate of $1.00. During the third quarter, HWDLP's share of capital expenditures was $10.4 million. During fiscal 2013, HWDLP's 40% share of the planned capital expenditures is expected to be approximately $64 million at an assumed average Canadian/US dollar exchange rate of $1.00. The Company has additionally staked 226,000 acres of mineral claims on the prospective geological trend to the southwest of the existing mine site and is starting a small but important basal till drilling program to assess the potential for new diamondiferous kimberlite pipes over the coming years. On September 6, 2011, the Company announced that Harry Winston Diamond Mines Ltd. and its wholly owned subsidiary, 6355137 Canada Inc., entered into an option agreement with North Arrow Minerals Inc. ("North Arrow") and Springbok Holdings Inc., ("Springbok") in regards to their Lac de Gras properties in the Northwest Territories. Under the terms of the agreement, the two properties collectively will form a "Joint Venture Property". In order for the option to vest, the Company is to carry out exploration on the Joint Venture Property, making expenditures of at least $5 million over a five-year period. Upon vesting, a joint venture will be formed, in which the Company will hold a 55% interest, and in which North Arrow and Springbok will equally share a 45% interest, in the entire Joint Venture Property. Luxury Brand The luxury brand segment includes sales from Harry Winston salons, which are located in prime markets around the world, including eight salons in the United States: New York, Beverly Hills, Bal Harbour, Honolulu, Las Vegas, Dallas, Chicago and Costa Mesa; five salons in Japan: Ginza, Roppongi Hills, Osaka, Omotesando and Nagoya; two salons in Europe: Paris andLondon; and four salons in Asia outside of Japan: Beijing, Taipei, Hong Kong and Singapore. Sales for the third quarter were $83.5 million compared to $80.2 millionfor the comparable quarter of the prior year, an increase of 4% (a decrease of 4% at constant exchange rates). US sales increased 44% to $32.5 million, sales in Asia increased 14% to $28.3 million and European sales decreased 31% to $22.7 million. The third quarter of the prior year included several significant sales in Europe that were not repeated in the current third quarter. Cost of sales for the luxury brand segment for the third quarter was $41.4 million compared to $39.7 million for the comparable quarter of the prior year. Gross margin for the quarter was $42.1 million or 50.4% compared to $40.4 million or 50.4% for the third quarter of the prior year. SG&A expenses increased by 16% to $40.8 million from $35.1 million in the comparable quarter of the prior year (9% at constant exchange rates). The increase was due primarily to higher advertising, marketing and selling expenses and increased rent and building related expenses. Fixed costs accounted for $5.2 million of the increase, while variable expenses linked to higher volume of sales accounted for $0.5 million of the increase. SG&A expenses included depreciation and amortization expense of $3.1 million consistent with the comparable quarter of the prior year. Sales for the nine months ended October 31, 2011, were $298.1 million compared to $212.1 millionfor the comparable period of the prior year, an increase of 41% (29% at constant exchange rates). Sales in Asia increased 77% to $126.2 million, US sales increased 53% to $97.9 million and European sales decreased 4% to $74.0 million. During the period there were $60.8 million of high-value transactions, which carry generally lower-than-average gross margins. Cost of sales for the luxury brand segment for the nine months ended October 31, 2011, was $167.0 million compared to $102.7 million for the comparable period of the prior year. Gross margin for the nine months ended October 31, 2011, was $131.2 million or 44.0% compared to $109.5 million or 51.6% for the comparable period of the prior year. The decrease in gross margin resulted primarily from exceptional high-value transactions during the period, which carry generally lower-than-average gross margins. SG&A expenses increased by 19% to $118.9 million from $100.3 million in the comparable period of the prior year (11% at constant exchange rates). The increase was due primarily to higher advertising, marketing and selling expenses, higher variable compensation expenses resulting from higher sales and increased rent and building related expenses. Fixed costs accounted for $15.0 million of the increase, while variable expenses linked to higher volume of sales accounted for $3.6 million of the increase. SG&A expenses included depreciation and amortization expense of $9.4 million consistent with the comparable period of the prior year. During the nine months ended October 31, 2011, the luxury brand segment generated sales of $298.1 million, an increase of 41% over the comparable period of the prior year at actual exchange rates. The Company recorded significant high-value transactions of $60.8 million during the nine-month period. The US market generated sales of $97.9 million, an increase of 53% over the comparable quarter of the prior year. The long-term trend of growing wealth in Asia has resulted in increasing mobility of luxury consumers, benefiting the US market. In Japan, sales of $53.3 million increased by 25% at actual exchange rates and by 13% on a constant exchange rate basis over the comparable period of the prior year. Asia (excluding Japan) had sales of $72.9 million, representing an increase of 157% at actual exchange rates and positive 143% on a constant exchange basis over the comparable period of the prior year. In Europe, sales of $74.0 million were 4% lower at actual exchange rates and negative 17% on a constant exchange basis over the comparable period of the prior year. A new licensed Harry Winston salon was opened in the Emirates Towers in Dubai, United Arab Emirates, during the third quarter. The luxury brand segment's distribution network consists of 19 directly operated salons, three licensed salons (in Manila, Philippines, Kiev, Ukraine and Dubai, United Arab Emirates) and 190 wholesale watch doors around the world. Luxury Brand Segment Outlook The Company remains confident that its product offering, supported by a strong advertising campaign, will translate into solid fourth quarter results. The Company's global distribution network will continue to allow the Company to benefit from the increasing mobility of high-end luxury consumers. The Company continues to focus on strategies that will drive long-term growth. These strategies include initiatives to grow the core bridal and watch businesses, and new jewelry collections. A second licensed salon is expected to be opened in Dubai, United Arab Emirates, and the Company plans to add 10 wholesale watch doors through the remainder of the fiscal year. Two new directly operated salons in Shanghai, China, are expected to be opened early next year and a second directly operated salon in London, UK, in mid-2012. A key component of the luxury brand's growth strategy is the expansion of its current salon network and wholesale distribution channel. The growth target is to expand to approximately 35 directly operated salons, 15 licensed salons, and 300 wholesale doors by fiscal 2016. On May 19, 2011, the Company announced that Harry Winston Inc. had entered into a business arrangement with Diamond Asset Advisors AG ("DAA"), which is in the process of establishing a polished diamond investment fund (the "Fund"). The Fund will be structured as a limited partnership with total funding of up to $250 million, offering institutional investors direct exposure to the wholesale market price of polished diamonds. Under the terms of the arrangement with the Fund, the Company's expert diamond team will source diamonds for the Fund that have the same high-quality characteristics that the luxury brand segment uses in its jewelry and watches, with a portion of the diamonds coming from the Company's existing inventory. The Fund will purchase the diamonds and then consign them to Harry Winston Inc., which will act as custodian. Harry Winston Inc. will use the consigned polished diamonds in the manufacturing of its jewelry and watches, paying the Fund when the jewelry or watch is sold. The price paid by the Fund to replace the sold polished diamonds will be used to determine the Fund's market value. This arrangement will increase the inventory available to Harry Winston Inc.'s expanding international salon network without additional demands on working capital. The Fund is expected to raise the first capital subscription of approximately $100 million from investors in fiscal 2013, with the remaining $150 million expected to be raised over the following year, subject to market conditions. Working Capital As at October 31, 2011, the Company had unrestricted cash and cash equivalents of $83.2million compared to $108.7million at January 31, 2011. The Company had cash on hand and balances with banks of $80.9million and short-term investments of $2.3million at October 31, 2011. During the quarter ended October 31, 2011, the Company reported use of cash from operations of $17.4million compared to a source of cash of $13.6million in the comparable quarter of the prior year, which resulted primarily from the Company's decision to hold rough diamond inventory due to market conditions. At October 31, 2011, the Company had 1.1 million carats of rough diamond inventory available for sale at an estimated current market value of $123 million. Working capital increased to $428.5million at October 31, 2011, from $328.6million at January 31, 2011. During the quarter, the Company increased accounts receivable by $0.9 million, increased inventory and supplies by $37.5million, increased other current assets by $2.8 million, increased trade and other payables by $5.9million and increased employee benefit plans by $0.5 million. The Company's liquidity requirements fluctuate from quarter to quarter depending on, among other factors, the seasonality of production at the Diavik Diamond Mine, the seasonality of mine operating expenses, capital expenditure programs, the number of rough diamond sales events conducted during the quarter and the volume, size and quality distribution of rough diamonds delivered from the Diavik Diamond Mine and sold by the Company in each quarter, along with the seasonality of sales and salon expansion in the luxury brand segment. The Company's principal working capital needs include investments in inventory, other current assets, and trade and other payables and income taxespayable. The Company assesses liquidity and capital resources on a consolidated basis. The Company's requirements are for cash operating expenses, working capital, contractual debt requirements and capital expenditures. The Company believes that it will generate sufficient liquidity to meet its anticipated requirements for the next twelve months. Financing Activities The mining segment maintains a senior secured revolving credit facility with Standard Chartered Bank that was increased from $100.0 million to $125.0 million on February 28, 2011. At October 31, 2011, $60.0 million was outstanding compared to $50.0 million at January 31, 2011. During the quarter, the Company paid the $70.0 million promissory note plus accrued interest owing to Kinross from cash on hand. The promissory note was issued to Kinross on August 25, 2010, as part of the consideration for reacquiring Kinross's 9% indirect interest in the Diavik Joint Venture. As at October 31, 2011, $34.7 million and $2.8 million was outstanding under the Company's revolving financing facility relating to its Belgium subsidiary, Harry Winston Diamond International N.V., and its India subsidiary, HarryWinston Diamond (India) Private Limited, respectively, compared to $nil at January 31, 2011. During the quarter ended October 31, 2011, the luxury brand subsidiary, Harry Winston Inc., increased the amount outstanding on its secured five-year revolving credit facility to $201.5 million from $165.0 million at January 31, 2011. Investing Activities During the third quarter, the Company purchased property, plant and equipment of $14.8million, of which $10.8million was purchased for the mining segment and $4.0 million for the luxury brand segment. 2011, $60.0 million was outstanding. note plus accrued interest to Kinross from cash on hand. The bank has a secured interest in the factory building. with two banks, amounting to Â¥1,170 million ($15.0 million). October 31, 2011, $6.6 million was outstanding on the mortgage. the next twelve months are approximated to be $10.8 million. of the Diavik Diamond Mine. for the Diavik Diamond Mine. In addition to discussing earnings measures in accordance with IFRS, the MD&A provides the following non-GAAP measure, which is also used by management to monitor and evaluate the performance of the Company and its business segments. The term EBITDA (earnings before interest, taxes, depreciation and amortization) does not have a standardized meaning according to IFRS and therefore may not be comparable to similar measures presented by other issuers. The Company defines EBITDA as sales minus cost of sales and selling, general and administrative expenses, meaning it represents operating profit before depreciation and amortization. EBITDA is a measure commonly reported and widely used by investors and analysts as an indicator of the Company's operating performance and ability to incur and service debt and as a valuation metric. EBITDA margin is defined as the ratio obtained by dividing EBITDA by sales. Harry Winston Diamond Corporation is subject to a number of risks and uncertainties as a result of its operations. Inaddition to the other information contained in this MD&A and the Company's other publicly filed disclosure documents, readers should give careful consideration to the following risks, each of which could have a material adverse effect on the Company's business prospects or financial condition. Nature of Mining The operation of the Diavik Diamond Mine is subject to risks inherent in the mining industry, including variations in grade and other geological differences, unexpected problems associated with required water retention dikes, water quality, surface and underground conditions, processing problems, equipment performance, accidents, labour disputes, risks relating to the physical security of the diamonds, force majeure risks and natural disasters. Particularly with underground mining operations, inherent risks include variations in rock structure and strength as it impacts on mining method selection and performance, de-watering and water handling requirements, achieving the required paste backfill strengths, and unexpected local ground conditions. Hazards, such as unusual or unexpected rock formations, rock bursts, pressures, collapses, flooding or other conditions, may be encountered during mining. Such risks could result in personal injury or fatality; damage to or destruction of mining properties, processing facilities or equipment; environmental damage; delays, suspensions or permanent reductions in mining production; monetary losses; and possible legal liability. The Diavik Diamond Mine, because of its remote northern location and access only by winter road or by air, is subject to special climate and transportation risks. These risks include the inability to operate or to operate efficiently during periods of extreme cold, the unavailability of materials and equipment, and increased transportation costs due to the late opening and/or early closure of the winter road. Such factors can add to the cost of mine development, production and operation and/or impair production and mining activities, thereby affecting the Company's profitability. Nature of Joint Arrangement with DDMI HWDLP holds an undivided 40% interest in the assets, liabilities and expenses of the Diavik Diamond Mine and the Diavik group of mineral claims. The Diavik Diamond Mine and the exploration and development of the Diavik group of mineral claims is a joint arrangement between DDMI (60%) and HWDLP (40%), and is subject to the risks normally associated with the conduct of joint ventures and similar joint arrangements. These risks include the inability to exert influence over strategic decisions made in respect of the Diavik Diamond Mine and the Diavik group of mineral claims. Byvirtue of DDMI's 60% interest in the Diavik Diamond Mine, it has a controlling vote in virtually all Joint Venture management decisions respecting the development and operation of the Diavik Diamond Mine and the development of the Diavik group of mineral claims. Accordingly, DDMI is able to determine the timing and scope of future project capital expenditures, and therefore is able to impose capital expenditure requirements on HWDLP that the Company may not have sufficient cash to meet. A failure to meet capital expenditure requirements imposed by DDMI could result in HWDLP's interest in the Diavik Diamond Mine and the Diavik group of mineral claims being diluted. Diamond Prices and Demand for Diamonds The profitability of the Company is dependent upon production from the Diavik Diamond Mine and on the results of the operations of its luxury brand operations. Each, in turn, is dependent in significant part upon the worldwide demand for and price of diamonds. Diamond prices fluctuate and are affected by numerous factors beyond the control of the Company, including worldwide economic trends, particularly in the US, Japan, China and India, worldwide levels of diamond discovery and production, and the level of demand for, and discretionary spending on, luxury goods such as diamonds and jewelry. Low or negative growth in the worldwide economy, renewed or additional credit market disruptions, natural disasters or the occurrence of further terrorist attacks or similar activities creating disruptions in economic growth could result in decreased demand for luxury goods such as diamonds and jewelry, thereby negatively affecting the price of diamonds and jewelry. Similarly, a substantial increase in the worldwide level of diamond production or in diamonds available for sale through recommencement of suspended mining activity or the release of stocks held back during recent periods of low demand could also negatively affect the price of diamonds. In each case, such developments could have a material adverse effect on the Company's results of operations. Cash Flow and Liquidity The Company's liquidity requirements fluctuate from quarter to quarter and year to year depending on, among other factors, the seasonality of production at the Diavik Diamond Mine, the seasonality of mine operating expenses, exploration expenses, capital expenditure programs, the number of rough diamond sales events conducted during the quarter and the volume, size and quality distribution of rough diamonds delivered from the Diavik Diamond Mine and sold by the Company in each quarter, along with the seasonality of sales and salon refurbishment and expansion in the luxury brand segment. The Company's principal working capital needs include investments in inventory, prepaid expenses and other current assets, and accounts payable and income taxes payable. There can be no assurance that the Company will be able to meet each or all of its liquidity requirements. A failure by the Company to meet its liquidity requirements could result in the Company failing to meet its planned development objectives, or in the Company being in default of a contractual obligation, each of which could have a material adverse effect on the Company's business prospects or financial condition. Economic Environment The Company's financial results are tied to the global economic conditions and their impact on levels of consumer confidence and consumer spending. The global markets have experienced the impact of a significant US and international economic downturn since the fall of 2008. This has restricted the Company's growth opportunities both domestically and internationally, and a return to a recession or weak recovery, due to recent disruptions in financial markets in the US and the European Union or otherwise, the 2011 disaster in Japan and political upheavals in the Middle East, could cause the Company to experience further revenue declines across both of its business segments due to deteriorated consumer confidence and spending, and a decrease in the availability of credit, which could have a material adverse effect on the Company's business prospects or financial condition. The credit facilities essential to the diamond polishing industry are largely underwritten by European banks that are currently under stress with the European sovereign debt issue. The withdrawal or reduction of such facilities could also have a material adverse effect on the Company's business prospects or financial condition. The Company monitors economic developments in the markets in which it operates and uses this information in its continuous strategic and operational planning in an effort to adjust its business in response to changing economic conditions. Currency Risk Currency fluctuations may affect the Company's financial performance. Diamonds are sold throughout the world based principally on the USdollar price, and although the Company reports its financial results in US dollars, a majority of the costs and expenses of the DiavikDiamond Mine are incurred in Canadian dollars. Further, the Company has a significant deferred income tax liability that has been incurred and will be payable in Canadian dollars. The Company's currency exposure relates primarily to expenses and obligations incurred by it in Canadian dollars and, secondarily, to revenues of Harry Winston Inc. in currencies other than the US dollar. The appreciation of the Canadian dollar against the US dollar, and the depreciation of other currencies against the US dollar, therefore, will increase the expenses of the Diavik Diamond Mine and the amount of the Company's Canadian dollar liabilities relative to the revenue theCompany will receive from diamond sales, and will decrease the US dollar revenues received by Harry Winston Inc. Fromtime to time, the Company may use a limited number of derivative financial instruments to manage its foreign currencyexposure. Licences and Permits The operation of the Diavik Diamond Mine and exploration on the Diavik property requires licences and permits from the Canadian government. The Diavik Diamond Mine Type "A" Water Licence was renewed by the regional Wek'eezhii Land and Water Board to October31, 2015. While the Company anticipates that DDMI, the operator of the Diavik Diamond Mine, will be able to renew this licence and other necessary permits in the future, there can be no guarantee that DDMI will be able to do so or obtain or maintain all other necessary licences and permits that may be required to maintain the operation of the Diavik Diamond Mine or to further explore and develop the Diavikproperty. Regulatory and Environmental Risks The operation of the Diavik Diamond Mine, exploration activities at the Diavik Project and the manufacturing of jewelry and watches are subject to various laws and regulations governing the protection of the environment, exploration, development, production, taxes, labour standards, occupational health, waste disposal, mine safety, manufacturing safety and other matters. New laws and regulations, amendments to existing laws and regulations, or more stringent implementation or changes in enforcement policies under existing laws and regulations could have a material adverse effect on the Company by increasing costs and/or causing a reduction in levels of production from the DiavikDiamond Mine and in the manufacture of jewelry and watches. As well, as the Company's international operations expand, it or its subsidiaries become subject to laws andregulatory regimes that could differ materially from those under which they operate in Canada and the US. Mining and manufacturing are subject to potential risks and liabilities associated with pollution of the environment and the disposal of waste products occurring as a result of mining and manufacturing operations. To the extent that the Company's operations are subject to uninsured environmental liabilities, the payment of such liabilities could have a material adverse effect on the Company. Climate Change Canada ratified the Kyoto Protocol to the United Nations Framework Convention on Climate Change in late 2002 and the Kyoto Protocol came into effect in Canada in February 2005. The Canadian government has established a number of policy measures in order to meet its emission reduction guidelines. While the impact of these measures cannot be quantified at this time, the likely effect will be to increase costs for fossil fuels, electricity and transportation; restrict industrial emission levels; impose added costs for emissions in excess of permitted levels; and increase costs for monitoring and reporting. Compliance with these initiatives could have a material adverse effect on the Company's results of operations. Resource and Reserve Estimates The Company's figures for mineral resources and ore reserves on the Diavik group of mineral claims are estimates, and no assurance can be given that the anticipated carats will be recovered. The estimation of reserves is a subjective process. Forecasts are based on engineering data, projected future rates of production and the timing of future expenditures, all of which are subject to numerous uncertainties and various interpretations. The Company expects that its estimates of reserves will change to reflect updated information as well as to reflect depletion due to production. Reserve estimates may be revised upward or downward based on the results of current and future drilling, testing or production levels, and on changes in mine design. In addition, market fluctuations in the price of diamonds or increases in the costs to recover diamonds from the Diavik Diamond Mine may render the mining of ore reserves uneconomical. Mineral resources that are not mineral reserves do not have demonstrated economic viability. Due to the uncertainty that may attach to inferred mineral resources, there is no assurance that mineral resources at the Diavik property will be upgraded to proven and probable ore reserves. Insurance The Company's business is subject to a number of risks and hazards, including adverse environmental conditions, industrial accidents, labour disputes, unusual or unexpected geological conditions, risks relating to the physical security of diamonds and jewelry held as inventory or in transit, changes in the regulatory environment and natural phenomena such as inclement weather conditions. Such occurrences could result in damage to the Diavik Diamond Mine, personal injury or death, environmental damage to the Diavik property, delays in mining, the closing of Harry Winston Inc.'s manufacturing facilities or salons, monetary losses and possible legal liability. Although insurance is maintained to protect against certain risks in connection with the Diavik Diamond Mine and the Company's operations, the insurance in place will not cover all potential risks. It may not be possible to maintain insurance to cover insurable risks at economically feasible premiums. Fuel Costs The Diavik Diamond Mine's expected fuel needs are purchased periodically during the year for storage, and transportedto the mine site by way ofthe winter road. These costs will increase if transportation by air freight is required due to a shortened "winter road season" or unexpected high fuel usage. Thecost of the fuelpurchased is based on the then prevailingprice and expensed into operating costs ona usage basis. TheDiavik Diamond Mine currently has no hedges for its future anticipated fuel consumption. Reliance on Skilled Employees Production at the Diavik Diamond Mine is dependent upon the efforts of certain skilled employees of DDMI. The loss of these employees or the inability of DDMI to attract and retain additional skilled employees may adversely affect the level of diamond production from the DiavikDiamond Mine. The Company's success in marketing rough diamonds and operating the business of Harry Winston Inc. is dependent on the services of key executives and skilled employees, as well as the continuance of key relationships with certain third parties, such as diamantaires. The loss of these persons or the Company's inability to attract and retain additional skilled employees or to establish and maintain relationships with required third parties may adversely affect its business and future operations in marketing diamonds and operating its luxury brand segment. Expansion and Refurbishment of the Existing Salon Network A key component of the Company's luxury brand strategy in recent years has been the expansion of its salon network. The Company currently expects to expand its retail salon network to a total of 35 salons and 300 wholesale doors worldwide by fiscal 2016. An additional objective of the Company is to achieve a compound annual growth rate in sales in the mid-teens in the luxury brand segment and an operating profit in the low to mid-teens in the luxury brand segment, in each case over the five-year period from fiscal 2012 to 2016. Although the Company considers these objectives to be reasonable, they are subject to a number of risks and uncertainties, and there can be no assurance that these objectives will be realized. This strategy requires the Company to make ongoing capital expenditures to build and open new salons, to refurbish existing salons from time to time, and to incur additional operating expenses in order to operate the new salons. 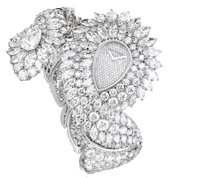 To date, much of this expansion has been financed by Harry Winston Inc. through borrowings. The successful expansion of the Company's global salon network, and achieving an increase in sales and in operating profit, will depend on a variety of factors, including worldwide economic conditions, market demand for luxury goods, the strength of the Harry Winston brand and the availability of sufficient funding. There can be no assurance that the expansion of the salon network will continue or that the current expansion will prove successful in increasing annual sales or earnings from the luxury brand segment, and the increased debt levels resulting from this expansion could negatively impact the Company's liquidity and its results from operations in the absence of increased sales and earnings. The Company has to date licensed three retail salons to operate under the Harry Winston name and currently expects to increase the number of licensed salons to 15 by fiscal 2016. There is no assurance that the Company will be able to find qualified third parties to enter into these licensing arrangements, or that the licensees will honour the terms of the agreements. The conduct of licensees may have a negative impact on the Company's distinctive brand name and reputation. Competition in the Luxury Brand Segment The Company is exposed to competition in the luxury brand market from other luxury goods, diamond, jewelry and watch retailers. The ability of Harry Winston Inc. to successfully compete with such luxury goods, diamond, jewelry and watch retailers is dependent upon a number of factors, including the ability to source high-end polished diamonds and protect and promote its distinctive brand name and reputation. If HarryWinston Inc. is unable to successfully compete in the luxury jewelry segment, the Company's results of operations will be adversely affected. During the third quarter of fiscal 2012, there were no changes in the Company's disclosure controls and procedures or internal control over financial reporting that materially affected, or are reasonably likely to materially affect, the Company's disclosure controls and procedures or internal control over financial reporting. Management is often required to make judgments, assumptions and estimates in the application of IFRS that have a significant impact on the financial results of the Company. Certain policies are more significant than others and are, therefore, considered critical accounting policies. Accounting policies are considered critical if they rely on a substantial amount of judgment (use of estimates) in their application or if they result from a choice between accounting alternatives and that choice has a material impact on the Company's reported resultsor financial position. There have been no significant changes to critical accounting estimates since the first quarter of fiscal 2012. The International Accounting Standards Board ("IASB") has issued a new standard, IFRS 9, "Financial Instruments" ("IFRS 9"), which will ultimately replace IAS 39, "Financial Instruments: Recognition and Measurement" ("IAS 39"). IFRS 9 provides guidance on the classification and measurement of financial assets and financial liabilities. This standard becomes effective for the Company's fiscal year end beginning February 1, 2013. The Company is currently assessing the impact of the new standard on its financial statements. IFRS 11, "Joint Arrangements" ("IFRS 11"), was issued by the IASB on May 12, 2011, and will replace IAS 31, "Interest in Joint Ventures". The new standard will apply to the accounting for interests in joint arrangements where there is joint control. Under IFRS 11, joint arrangements are classified as either joint ventures or joint operations. The structure of the joint arrangement will no longer be the most significant factor in determining whether a joint arrangement is either a joint venture or a joint operation. Proportionate consolidations will no longer be allowed and will be replaced by equity accounting. IFRS 11 is effective for the Company's fiscal year end beginning February 1, 2013, with early adoption permitted. The Company is currently assessing the impact of IFRS 11 on its results of operations and financial position. IFRS 13, "Fair Value Measurement" ("IFRS 13"), was also issued by the IASB on May 12, 2011. The new standard makes IFRS consistent with generally accepted accounting principles in the United States ("US GAAP") on measuring fair value and related fair value disclosures. The new standard creates a single source of guidance for fair value measurements. IFRS 13 is effective for the Company's fiscal year end beginning February 1, 2013, with early adoption permitted. The Company is assessing the impact of IFRS 13 on its consolidated financial statements. Additional information relating to the Company, including the Company's most recently filed Annual Information Form,can be found on SEDAR at www.sedar.com, and is also available on the Company's website at http://investor.harrywinston.com. Harry Winston Diamond Corporation (the "Company") is a diamond enterprise with assets in the mining and luxury brand segments of the diamond industry. The Company's mining asset is an ownership interest in the Diavik group of mineral claims. The Diavik Joint Venture (the "Joint Venture") is an unincorporated joint arrangement between Diavik Diamond Mines Inc. ("DDMI") (60%) and HarryWinston Diamond Limited Partnership ("HWDLP") (40%) where HWDLP holds an undivided 40% ownership interest in the assets, liabilities and expenses of the Diavik Diamond Mine. DDMI is the operator of the Diavik Diamond Mine. DDMI and HWDLP are headquartered in Yellowknife, Canada. DDMI is a wholly owned subsidiary of Rio Tinto plc of London, England, and Harry Winston Diamond Limited Partnership is a wholly owned subsidiary of HarryWinston Diamond Corporation of Toronto, Canada. The Company also owns Harry Winston Inc., the premier fine jewelry and watch retailer with select locations throughout the world. Its head office is located in New York City, United States. The Company is incorporated and domiciled in Canada and its shares are publicly traded on the Toronto Stock Exchange and the New York Stock Exchange. The address of its registered office is Toronto, Ontario. These unaudited interim condensed consolidated financial statements have been approved for issue by the Audit Committee on December 8, 2011.
expects to be applicable at that time. consolidated financial statements of April 30, 2011. The following standards and interpretations have been issued but are not yet effective and have not been early adopted in these financial statements. These standards may result in consequential changes to the accounting policies and other note disclosures. The IASB has issued a new standard, IFRS 9, "Financial Instruments" ("IFRS 9"), which will ultimately replace IAS 39, "Financial Instruments: Recognition and Measurement" ("IAS 39"). IFRS 9 provides guidance on the classification and measurement of financial assets and financial liabilities. This standard becomes effective for the Company's fiscal year end beginning February 1, 2013. The Company is currently assessing the impact of the new standard on its financial statements. IFRS 11, "Joint Arrangements" ("IFRS 11") was issued by the IASB on May 12, 2011 and will replace IAS 31, "Interest in Joint Ventures". The new standard will apply to the accounting for interests in joint arrangements where there is joint control. Under IFRS 11, joint arrangements are classified as either joint ventures or joint operations. The structure of the joint arrangement will no longer be the most significant factor in determining whether a joint arrangement is either a joint venture or a joint operation. Proportionate consolidations will no longer be allowed and will be replaced by equity accounting. IFRS 11 is effective for the Company's fiscal year end beginning February 1, 2013, with early adoption permitted. The Company is currently assessing the impact of IFRS 11 on its results of operations and financial position. IFRS 13, "Fair Value Measurement" ("IFRS 13") was also issued by the IASB on May 12, 2011. The new standard makes IFRS consistent with generally accepted accounting principles in the United States ("US GAAP") on measuring fair value and related fair value disclosures. The new standard creates a single source of guidance for fair value measurements. IFRS 13 is effective for the Company's fiscal year end beginning February 1, 2013, with early adoption permitted. The Company is assessing the impact of IFRS 13 on its consolidated financial statements. ((a)) Short-term investments are held in overnight deposits and money market instruments with a maturity of 30 days. Total inventory and supplies is net of a provision for obsolescence of $ 2.0 million ($2.9 million at January 31, 2011). ((a))     The Joint Venture only earns interest income. HWDLP is contingently liable for DDMI's portion of the liabilities of the Joint Venture, and to the extent HWDLP's participating interest has increased because of the failure of DDMI to make a cash contribution when required, HWDLP would have access to an increased portion of the assets of the Joint Venture to settle these liabilities. During the third quarter, the Company recognized a non-cash $13.0 million charge related to the de-recognition of certain components of the backfill plant (the "Paste Plant") associated with paste production at the Diavik Diamond Mine. The original mine plan envisioned the use of blasthole stoping and underhand cut and fill underground mining methods for the Diavik ore bodies using paste to preserve underground stability. It is now expected that the higher velocity and lower cost sub-level retreat mining method, which does not require paste, will be used for both the A-154 South and A-418 underground ore bodies. As a result, certain components of the Paste Plant necessary for the production of paste will no longer be required and accordingly have been de-recognized during the third quarter. Amortization expense for the nine months ended October 31, 2011 was $0.4 million ($1.0 million for the nine months ended October 31, 2010). bank loan         US      3.75%        2013    million   million         Harry Winston Inc.
bank loan        CHF      3.15%        2013    million   million         Harry Winston S.A.
bank loan        CHF      3.55%    31, 2033    million   million         Harry Winston S.A.
bank loan         US      4.36%        2013    million   million                 Mines Ltd.
property         CDN      7.98%     1, 2018    million   million        6019838 Canada Inc.
advance           US      4.55%      demand    million   million         International N.V.
advance          YEN      2.50%    22, 2012    million   million                       K.K. advance          YEN      2.98%    30, 2011    million   million                       K.K. advance          YEN      2.98%    24, 2011    million   million                       K.K. On February 28, 2011, the Company increased the mining segment senior secured revolving credit facility with Standard Chartered Bank by $25.0 million to $125.0 million. On August 25, 2011, the Company paid the $70.0 million Kinross Gold Corporation's ("Kinross") promissory note plus accrued interest to Kinross from cash on hand. During the period, the Company granted 66,991 RSUs (net of forfeitures) and 29,583 DSUs under an employee and director incentive compensation program, respectively. The RSU and DSU Plans are full value phantom shares that mirror the value of Harry Winston Diamond Corporation's publicly traded common shares. Grants under the RSU Plan are on a discretionary basis to employees of the Company subject to Board of Directors approval. The RSUs granted vest one-third on March 31 and one-third on each anniversary thereafter. The vesting of grants of RSUs is subject to special rules for a change in control, death and disability. The Company shall pay out cash on the respective vesting dates of RSUs and redemption dates of DSUs. Only non-executive directors of the Company are eligible for grants under the DSU Plan. Each DSU grant vests immediately on the grant date. The expenses related to the RSUs and DSUs are accrued based on fair value. This expense is recognized on a straight-line basis over each vesting period. requirement will be approximately $0.2 million for calendar 2011.
social, economic and cultural well-being of the Aboriginal bands. terminate in the event that the mine permanently ceases to operate. participation agreements as at October 31, 2011 was $1.7 million. The Company's capital includes cash and cash equivalents, short-term debt, long-term debt and equity, which includes issued share capital, contributed surplus and retained earnings. The Company's primary objective with respect to its capital management is to ensure that it has sufficient cash resources to maintain its ongoing operations, to provide returns to shareholders and benefits for other stakeholders, and to pursue growth opportunities. To meet these needs, the Company may from time to time raise additional funds through borrowing and/or the issuance of equity or debt or by securing strategic partners, upon approval by the Board of Directors. The Board of Directors reviews and approves any material transactions out of the ordinary course of business, including proposals on acquisitions or other major investments or divestitures, as well as annual capital and operating budgets. The Company has various financial instruments comprising cash and cash equivalents, accounts receivable, trade and other payables, and interest-bearing loans and borrowings. Cash and cash equivalents consist of cash on hand and balances with banks and short-term investments held in overnight deposits with a maturity on acquisition of less than 90 days. Cash and cash equivalents, which are designated as held-for-trading, are carried at fairvalue based on quoted market prices and are classified within Level 1 of the fair value hierarchy established by the International Accounting Standards Board. The fair value of accounts receivable is determined by the amount of cash anticipated to be received in the normal course of business from the financial asset. The Company's interest-bearing loans and borrowings are for the most part fully secured; hence the fair values of these instruments at October 31, 2011 are considered to approximate their carrying value. The Company operates in two segments within the diamond industry, mining and luxury brand, for the three and nine months ended October 31, 2011. The mining segment consists of the Company's rough diamond business. This business includes the 40% ownership interest in the Diavik group of mineral claims and the sale of rough diamonds. The luxury brand segment consists of the Company's ownership in Harry Winston Inc. This segment consists of the marketing of fine jewelry and watches on a worldwide basis. ((a)) Sales to one significant customer in the luxury brand segment totalled $45.0 million for the nine months ended October 31, 2011. As stated in Note 2(a), these are the Company's third consolidated interim financial statements prepared in accordance with IFRS. The accounting policies described in Note 3 of the April 30, 2011 unaudited interim condensed consolidated financial statements have been applied in preparing: the interim financial statements for the three and nine months ended October 31, 2011, and the comparative information presented in these interim financial statements for both the three and nine months ended October 31, 2010. In preparing these interim financial statements, the Company has adjusted amounts reported previously in financial statements prepared in accordance with Canadian GAAP. An explanation of how the transition from Canadian GAAP to IFRS has affected the Company's financial position and financial performance is set out in the following tables and the notes that accompany the tables. the seller's tax rate was applied under Canadian GAAP. deferred income tax assets and deferred income tax recovery. the exploration activity relates to proven and probable reserves. deferred income tax expense both increased by $0.2 million. expense both increased by $0.5 million. applied this approach at the date of transition. change was made to deferred income tax liabilities. liabilities" in preparing its opening balance sheet under IFRS. obligation from the amount on February 1, 2010.
tax rate to determine the related deferred tax balance. different from the local currency. increase in deferred income tax recovery. to non-controlling interest also increased nominally. earnings was increased by $28.8 million. adjustments attributable to non-controlling interest.